Dave Littlefield is not a good general manager. This is unfortunate for the city of Pittsburgh, as he has been the Pirates' general manager for over six years. Over that period, he has made bad decision after bad decision, keeping the team near the bottom of Major League Baseball's franchise hierarchy. Because of this, he is constantly blasted by local media and fans. However, in January, he did make a rare intelligent deal. Closer Mike Gonzalez and minor league shortstop Brent Lillibridge were sent to Atlanta for first baseman Adam LaRoche and minor league outfielder Jamie Romak. As most people know, LaRoche started the season in a terrible slump. At the end of April, he was hitting just .133/.255/.265. As one might expect, the fan base was in an outrage. Gonzalez's ERA was 1.74, and it seemed that Littlefield had blown it again. But the season is 162 games long, and much has changed since April. Gonzalaez was even better in May, but his success did not last long. By the end of the month, his season was over due to Tommy John surgery. It was known before the trade that Gonzalez was a high-risk acquisition. He missed time due to an arm injury in 2006, and his power style of pitching added to the concern. After his horrific April, LaRoche's numbers have steadily risen. Somewhat remarkably, he is currently hitting .267/.342/.455 with 20 home runs. Those are not quite the statistics we were hoping for in January, but they are not as far off as most feared four months ago. 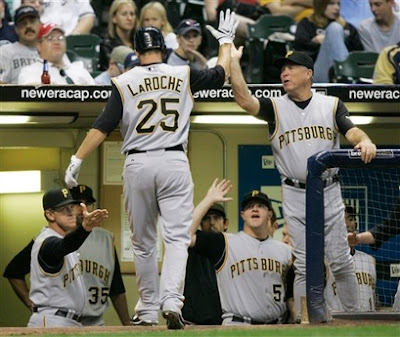 LaRoche has been much more valuable to the Pirates than Gonzalez has been to the Braves. Many felt that the key to this transaction would be the performance of Brent Lillibridge. He was one of the top prospects in the Pirates' minor league system before the trade, and many knowledgeable Atlanta fans found it possible that he could find himself starting at second base for the Braves in 2007. Lillibridge started the season at Double-A Mississippi, and posted an unimpressive line of .275/.355/.387 in 204 at-bats. He was promoted to Triple-A Richmond, and hit marginally better, at .287/.331/.436 in 321 at-bats. It always hurts to lose a decent prospect, especially considering the sad state of the Pirates' minor league system, but Lillibridge's mediocre stats in 2007 have eased my anxiety. On the other hand, Romak has continued posting strange, Adam Dunn-like numbers. In 363 at-bats combined with Hickory and Lynchburg, both Single-A teams, he hit .256/.383/.496 with 20 home runs, 114 strikeouts and 64 walks. A .256 batting average at that level is far from encouraging, but the patience and power potential makes this 21 year old an intriguing prospect. In the end, the Pirates got the left-handed power bat they were seeking and some much-needed minor league power. They lost a promising young reliever whose career is up in the air after a serious arm injury and a shortstop who will likely become an average Major League player. As the Pirates approach another losing season, as Dave Littlefield wastes his time trading for veteran past-their-prime pitchers, let us give him some credit for one of the few smart decisions he has made. Thanks for the info on LaRoche. The guy started producing for my fantasy team AFTER I was already out of it.